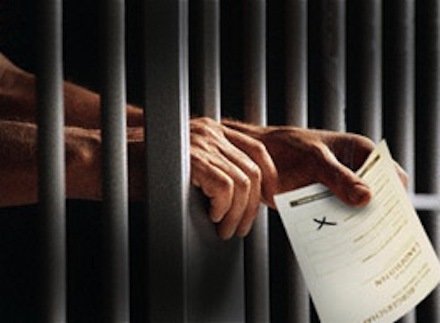 The UK is apparently fighting a losing battle to prevent inmates from gaining the right to vote in general elections. The European Court of Human Rights, which ruled back in 2005 that the UK’s longstanding blanket ban on prisoner voting was “unlawful”, recently reiterated its ruling and gave Britain six months to set the relevant wheels of compliance in motion. Failure to do so could result in hefty legal costs for the government, but complying with the ECHR’s decision is certain to get MPs a-grumblin’ – particularly in view of last year’s motion opposing the ruling, which passed with support to the practically unanimous tune of 234 votes to 22 and no doubt caused ministers a headache when attempting to explain this response to Strasbourg. David Cameron made things no easier, being quoted as saying that the very idea of prisoners being allowed to vote made him feel “physically ill”. The PM’s delicate stomach notwithstanding, this is an interesting debate and by no means a clear-cut issue. Now, I’m sure this is a naive and simplistic view, but I thought that prisons were where societies put people who had revealed themselves to be incapable of behaving according to a general set of rules upheld by the majority, and who were therefore required to be temporarily removed from that society until deemed fit to re-enter, with such terms being determined in accordance with the nature and severity of their crime. Not being a legal expert, I nevertheless hope that this is an adequate enough summation for the purposes of this article. It is a notion held by many individuals that, if a member of society breaches the rights of others with their actions, they should in turn have their own rights impinged upon in some way. This would seem to be the main function of correctional facilities – and, in the view of many people, the overriding purpose of such. So, would it not logically follow that those who have removed themselves from society and forfeited certain rights – such as the rights to walk around unhindered and live in a house – also lose their right to add their opinion to the way in which that society is run? Seems straightforward enough. But there’s a reason I used the term “correctional facilities” just then. For the overwhelming majority, prisons are also institutions in which inmates may be (and often are) rehabilitated, in order that they can at some point rejoin society and become productive members thereof. For those serving shorter sentences, those showing genuine remorse and a willingness to reform, those due for imminent release… shouldn’t they have the right to be included in the business of shaping the society they’re going to be rejoining? Justice Secretary Ken Clarke, somewhat unsurprisingly, had an interesting view on the matter, and prior to last year’s vote on the motion to oppose the European ruling had urged MPs and ministers to not contest the decision. However, the main thrust of his argument seemed to be that, if the UK did not comply, it would face costly compensation claims brought by prisoners – did MPs really want to risk having to explain to their constituents why exactly so much taxpayer money was being paid out to criminals? Better to just comply with the ECHR’s decision, Mr Clarke suggested – voting is a right that prisoners “probably wouldn’t bother to exercise if we gave it to them.” Given that voter turnout for the 2010 General Election was only 65%, he may have a point. (Labour activist Emma Burnell, blogging on TotalPolitics.com, argues for voting to be compulsory, like jury duty. She may have a point, too.) As an update to Mr Clarke’s opinion, the ECHR has said that, if the UK removes its blanket ban and agrees upon a set of criteria by which some prisoners will be allowed to vote, then it will dismiss the 2,500 or so human rights cases currently being brought by UK inmates, thus protecting the UK from the otherwise likely risk of paying compensation to such complainants. Quite an incentive to comply, I think. However, it seems that the ban on prisoners voting is one of those issues that has garnered cross-party agreement – Ed Balls has said that the ECHR’s ruling was “the wrong thing” and that Labour will support any action by the Coalition to oppose the decision (after all, it was Labour that was in power when the landmark judgment was initially passed). I would almost hope that politicians’ reticence is merely an indignant, knee-jerk reaction to Europe attempting to force a change in UK law – the alternative is that no senior political figures in our country consider those incarcerated in our prison system worthy of basic rights. The vast majority of prisoners will be returning to society sooner or later – some of them following a term of wrongful imprisonment, such as the recently released Sam Hallam, who spent over seven years in jail after a miscarriage of justice saw him wrongfully convicted of murder. Wrongful convictions are far more common in the UK than we would like to believe and, due to their often routine nature, rarely make the news. The right to vote, as with other rights debated in a court when a person has broken the law, should be decided on an individual basis – tarring all criminals with the same no-vote brush is akin to suggesting that a petty thief is as bad as a serial killer. In short, it is simply not fair. Our legal system has long been in need of an overhaul; perhaps the perceived interference of the European court is necessary for change in the UK. How to apply the ruling in practical terms, however, is going to be complicated, and balancing the requirements of the ECHR with the wishes of our MPs is sure to be a delicate and longwinded task.